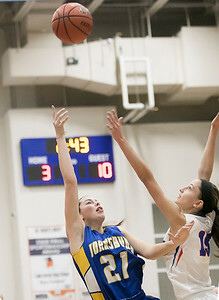 Sarah Nader- snader@shawmedia.com Johnsburg's Morgan Madsen (left) shoots over Lakes' Izzy Quaranta during the first quarter of Wednesday's game at the Lake Zurich Turkey Thriller girls hoops tournament Nov. 23, 2016. 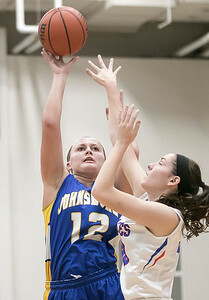 Johnsburg won, 60-46. Sarah Nader- snader@shawmedia.com Johnsburg's Ava Interrante (left) passes the ball during the second quarter of Wednesday's game against Lakes at the Lake Zurich Turkey Thriller girls hoops tournament Nov. 23, 2016. 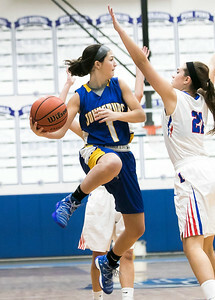 Johnsburg won, 60-46. 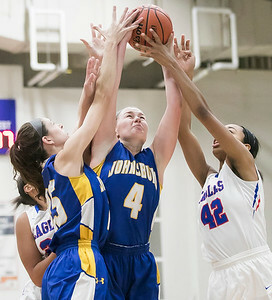 Sarah Nader- snader@shawmedia.com Johnsburg's Aannah Interrante (left) is guarded by Lakes' Sara Smith while she shoots a basket during the first quarter of Wednesday's game at the Lake Zurich Turkey Thriller girls hoops tournament Nov. 23, 2016. Johnsburg won, 60-46. Sarah Nader- snader@shawmedia.com Lakes' Paule Ceneac (left) guards Johnsburg's Kayla Stefka while she shoots a basket during the first quarter of Wednesday's game at the Lake Zurich Turkey Thriller girls hoops tournament Nov. 23, 2016. Johnsburg won, 60-46. Sarah Nader- snader@shawmedia.com Johnsburg's Morgan Madsen (left) is guarded by Lakes' Sara Smith while she dribbles towards the basket during the second quarter of Wednesday's game at the Lake Zurich Turkey Thriller girls hoops tournament Nov. 23, 2016. Johnsburg won, 60-46. 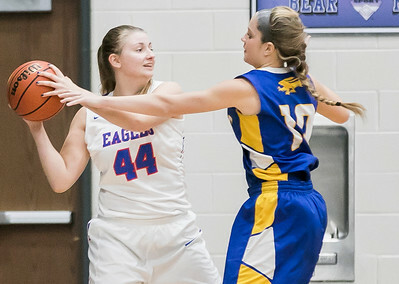 Sarah Nader- snader@shawmedia.com Lakes' Natalie Pawlak (left) is guarded by Johnsburg's Maggie Elliot while she looks for an open teammate during the second quarter of Wednesday's game at the Lake Zurich Turkey Thriller girls hoops tournament Nov. 23, 2016. Johnsburg won, 60-46. Sarah Nader- snader@shawmedia.com Johnsburg's Megan Madsen (center) grabs the rebound during the second quarter of Wednesday's game against Lakes at the Lake Zurich Turkey Thriller girls hoops tournament Nov. 23, 2016. Johnsburg won, 60-46. 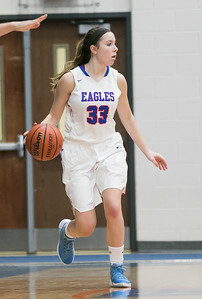 Sarah Nader- snader@shawmedia.com Lakes' Savannah Sikora drib;es towards the basket during the second quarter of Wednesday's game against Johnsburg at the Lake Zurich Turkey Thriller girls hoops tournament Nov. 23, 2016. Johnsburg won, 60-46. 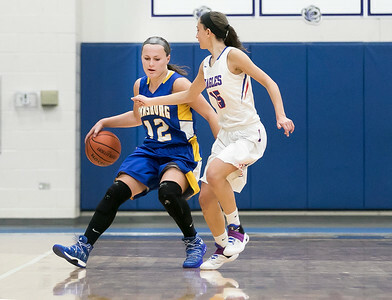 Johnsburg's Morgan Madsen (left) is guarded by Lakes' Sara Smith while she dribbles towards the basket during the second quarter of Wednesday's game at the Lake Zurich Turkey Thriller girls hoops tournament Nov. 23, 2016. 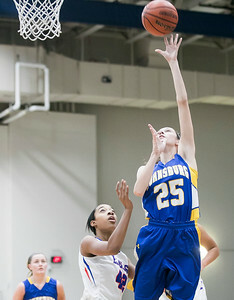 Johnsburg won, 60-46.